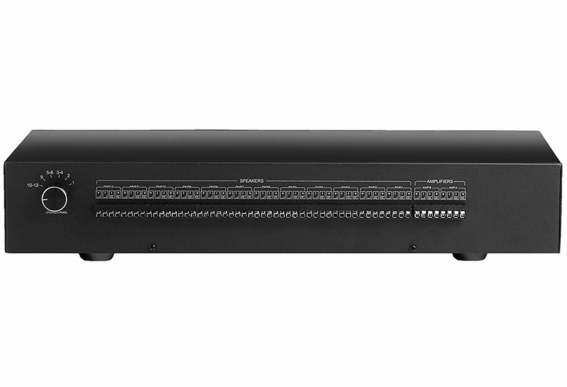 Ideal for larger whole-house audio systems or commercial/retail spaces, the TSM-12 allows you to connect up to 12 pairs of speakers (12 listening zones) and simplify control with just a push of a button. Equipped with flexible switching options, this powerful and highly efficient dual source speaker selector lets you choose which zones to play via a front panel push-button controls, and the dual source (A/B) switching feature lets you switch between two source amplifiers. Designed for use with either 4- or 8-ohm speakers, connect the TSM-12 to a high current amp and in wall volume controls to create a sophisticated but simplified whole house audio experience. To help protect expensive audio equipment, this high-power speaker selector includes low-frequency protection circuitry that reduces subsonic signals so you can safely drive multiple pairs of speakers without going below an amp’s impedance ratings. Going below the impedance rating can overheat or even damage expensive equipment or cause the amplifier to automatically shut off. 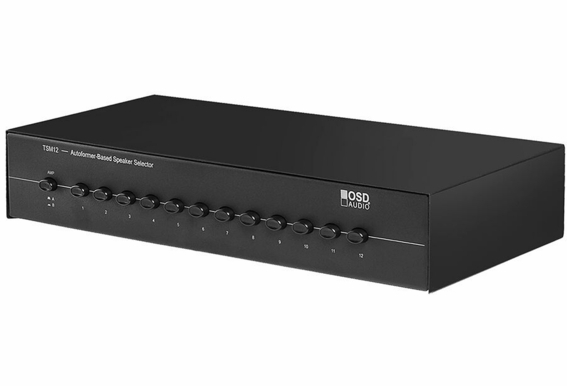 Highly efficient, audio-grade impedance-matching autoformers safely distribute maximum power throughout your system, while a rotary switch located on the rear panel can be used to set the appropriate impedance to be seen by your amplifier based on the number of pair of speakers connected. You don’t have to be a technical wizard to install the TSM-12. 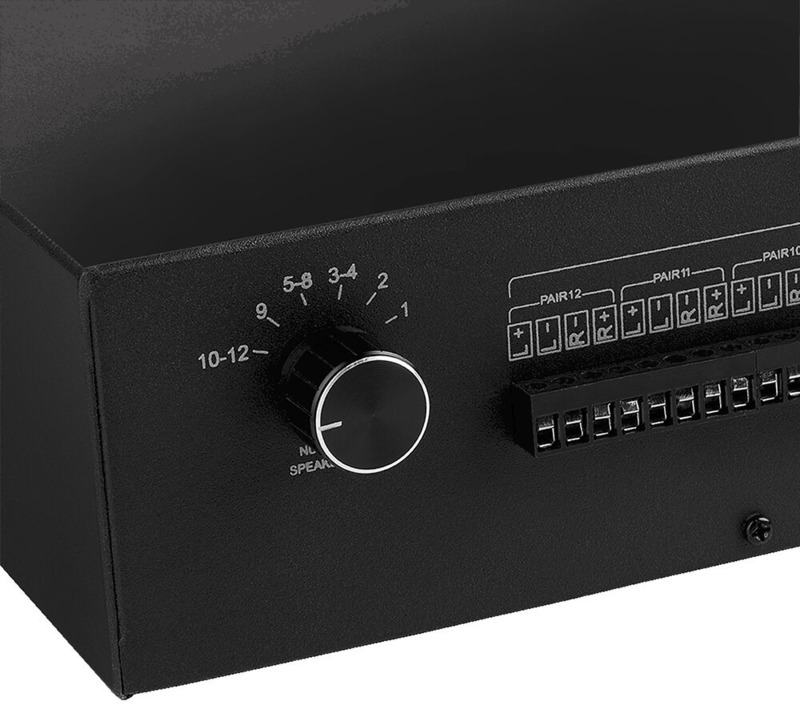 This speaker distribution system accepts up to 14-gauge speaker wire and includes removable and easily identifiable 4-pole snap-in amplifier and speaker connectors for ease of installation. To simplify control of multiple listening zones even further, we include die-cut labels that can be attached to each button to identify each listening zone, for example, dining room, kitchen, patio, etc. If you want a powerful speaker selector, the TSM-12 is a highly efficient dual source, impedance-matching speaker selector. It will handle more power and in cooler temperatures than the resister based speaker selectors. This high quality speaker selector is designed for use with either 4 or 8 ohm speakers. The A/B switch located on the front panel allows all your speakers to be driven from either of two amplifiers. When setting up a zone with 2 or 3 speakers, can the speakers be daisy chained or should each speaker have it's own separate speaker wire? I am asking for my church. We are lookinig to use this to control 12 headphone jacks attached to a single source. Would this work for that? We have seven speaker sets (14) wired into our new home & plan for two sets outside. Would this unit run these or would it require a larger unit. It would be used for music only.... Pandora. What type of volume control would work best with this system. I have a harmon kardon receiver avr 300 to hook up to this system. Would this work ok? I have an Onkyo TX-NR656 7.2 for home theater system (new), additionally 4 pairs of in ceiling speakers spread in 4 rooms. 2 pairs of Bose outdoor speakers, and a bose sa5 as additional receiver. Would like to control all speakers and the two receivers. Need the TSM-12DS and what else? We just bought a house which has 8 speaker-pairs in various rooms, along with a volume controller in each room for that speaker-pair. So ideally we need a speaker selector which doesn't have its own volume controller, but I was wondering if this TSM-12 unit will work just as well. 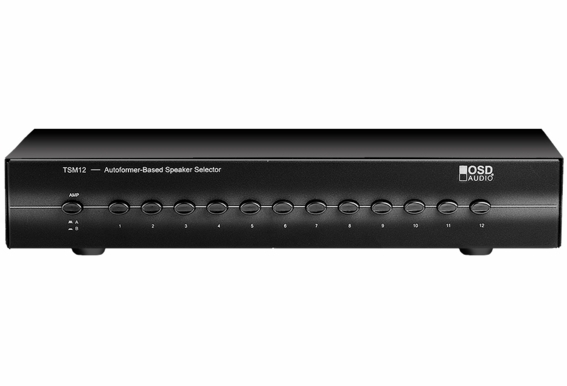 Also, we still have to purchase a receiver that can connect with TSM-12, has enough power output to handle all 8 speaker-pairs, and has flexibility to take different kind of inputs for music (for instance, can we wirelessly use our IPhone to play Pandora in 6 rooms and have the remaining 2 rooms play whats coming in the TV). Do you have any recommendations for such a receiver? Well, two years later we are dealing with the same problem we had when we originally purchased this speaker selector. Scan down and you will see the message from Jason from Visalia, Ca on the posts on this website. Our left channel is not working again. Is there a way to fix this on my end or do I need to send the unit in again? I wasn't expecting it to go out again after last time. We use the system about once a month so it is definitely not from over use or abuse. Thank you for your time and assistance. Hi Jason, From the looks of it, the reason you're running into this issue again is actually because of the receiver. Receivers aren't built to run multi-zone audio unless it's a single pair of speakers as your 2nd zone. 12 zones is far too many speakers to run off a single receiver. Not only will it not be supplying enough wattage through the two channels to accommodate 24 speakers, but the impedance load will be unstable for such a receiver to handle usually. I don't know if this was discussed with you in the past, but right away I noticed the receiver and automatically knew that is a potential issue. Typically our customers use our AMP300 when running anymore than 3-4 pairs of speakers off a single amp. The AMP300 not only has 300 total watts (150 per zone) but it is high-current so it can handle down to a 2ohm load. In my professional opinion, you need to upgrade your power. You can still utilize your receiver as the source of the music, but you need more power to run 24 speakers. Hello! I am outfitting the stereo system for our pub brewery, at a new location. The joint we are moving to, has 12 ceiling mount speakers 7 indoor, and 5 outdoor. This unit looks like a nice tool to simplify speaker control for the staff. We currently run a Denon AV surround receiver https://usa.denon.com/documentmaster/us/avr-687-om-e.pdf I have a hunch that it is under powered to run these all of these speakers. I would really appreciate some feedback on the TSM-12, and if it seems like a good fit for the application, and suggestions on the receiver/amplifier we would need. I am ready to purchase now the TSM-12 now. We have a new brewing facility being built in the spring, that will allow for 6 to 8 more speakers to be added to the system. Prost!! I have two Sherwood RX-773 receivers (4 channel 100w per channel = total 400w) cascaded together to handle 16 JBL Control1 speakers (8ohm 100w RMS). I am trying to reclaim some space (this is set up in my wife's small bar) for another piece of equipment (a karoake console). I want to eliminate one of the Sherwood receivers, by wiring all sixteen speakers to the TSM-12 (I may add more speakers in the future). My question is: will there be a degradation in the sound volume or quality by removing one of the receivers, and wiring the speakers to the TSM-12 leaving just the one receiver in place? Thanks on advance for any assistance. I have a new dental office where I will have 6 single speakers and 1 pair of speakers(waiting room) with 7 volume controls. I was told a speaker selector was the best way to accomplish this by connecting all the vol controls to the selector and the selector to the receiver. Would this selector do that for me. I GET THIS ZONE SELECTOR BUT MY QUESTION IS HOW CONNECTED TO PIONEER RECEIVER VSX-819 H-K? Hi, My Sony Receiver is connected to my home theater speakers. My TSM-12 is connected to speakers throughout the home and outside on my patio. The Sony Receiver is connected to the TSM-12 through the extra L and R speaker output on the Sony Receiver. When I want to power any of the speakers throughout the home or outside I put the Sony Receiver into a 2 Channel mode which only generates output through the extra L and R speaker output (which is connected to the TSM-12). I select the speakers I want to use on the TSM (which has been just the outside speakers and living room so far). All of the speakers connected to the TSM-12 have separate volume controls in each of the corresponding rooms/areas. Like I said, this was working great until the last time I used it which was during a party. towards the end of the party it cut out and now only the output from the left side pair of the TSM-12 is working. Thanks. jason -------------------------------------------------------------------------------- To: jason_kimberly@hotmail.com Subject: Here is the answer to your question about TSM-12 Dual Source 12 Zone Speaker Selector w/ Amplifier Protection From: do-not-reply@outdoorspeakerdepot.com Date: Sun, 20 May 2012 04:03:22 -0500 Dear Jason, Thanks so much for your interest in Outdoor Speaker Depot and in TSM-12 Dual Source 12 Zone Speaker Selector w/ Amplifier Protection. We have looked at the question you asked and we have an answer for you. Your question and our answer has also been published to our website where it can help other customers who are interested in TSM-12 Dual Source 12 Zone Speaker Selector w/ Amplifier Protection. Thanks for your contribution. Just as a reminder, you asked: It appears that speaker output from the TSM-12 is only coming from the left side of the pairs. Both left and right had been working. Driving the TSM-12 is a Sony Receiver 7.1 100w x 7. I have only used this three times. thank you in advance. Here is our answer: Hi Jason: We need a little more information. Are you trying to power the TSM12 with a Internal Amplifier (either channel 6 and 7) or an External Amplifier like our AMP300 using the Pre-amplified audio outputs or the Receiver? Can you please try and describe your system in depth? Are you using Volume Controls or depending on the internal protection of the TSM12 to Impedance match the system? 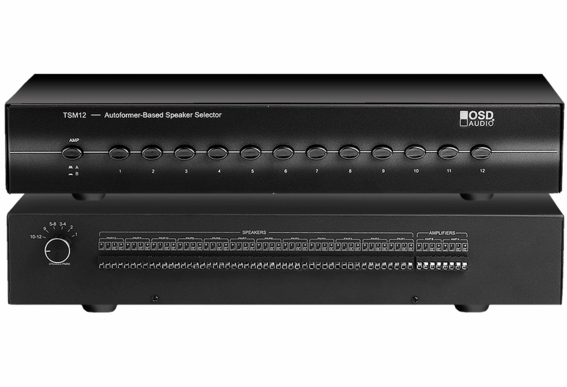 TL To buy the product now or to view more questions and answers about TSM-12 Dual Source 12 Zone Speaker Selector w/ Amplifier Protection just click here https://www.outdoorspeakerdepot.com/speaker-selector-transformer-dual-source-12-zone-with-amplifier-protection.html . We hope that you find our answer helpful. If you have any further questions, please do not hesitate to contact us at sales@outdoorspeakerdepot.com Peace, The Outdoor Speaker Depot Team Shop Outdoor Speaker Depot Now! It appears that speaker output from the TSM-12 is only coming from the left side of the pairs. Both left and right had been working. Driving the TSM-12 is a Sony Receiver 7.1 100w x 7. I have only used this three times. thank you in advance. If the AMP is 16 ohm and the speakers are 8 ohm with a total of 12 pairs of speakers what would be the correct setting for the rotary switch. Also, each pair of speakers has a VMS100 set at the default impedance matching setting. Can you hook up a stereo/receiver (home theatre receiver) to the TSM-12 or do you need an amplifier as well? Can you confirm the following configuration: Receiver amp source (rated 300 watts @ 8 ohms, 550 @ 4 ohms) channeled through the TSM-12 , then routed to 300 watt stereo in wall volume controls, and terminate to the ICE 840TT dual cone stereo speaker. How big or what kind of amp would I need for this to work well in my store? I have 9 pairs of speakers in my house that all run into a single wire bundle with a lead going to a single 8ohm 100w amp, which keeps shutting off. I put all the impedance jumpers on the room sound controls to x8 and that sort of fixed the amp cutting out most of the time. 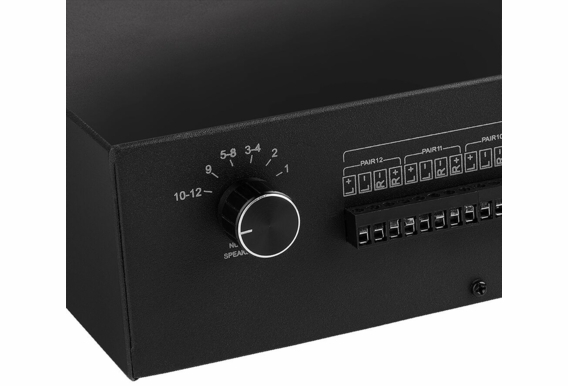 I have another amp that is a 2x100w, 2ch stereo amp that i want to try, can install this speaker switch using both channels (A & B) from my other AMP to power the spkrs--meaning can i run 5 pair on Ch. A and 4 pair on Ch. B? Or does this switch only allow you to run all 9 pairs on EITHER Ch. A OR Ch. B? Thanks. Hi TD: it would help to know what two amplifiers you actaully have already. Knowing the capabilities of each amplifier/receiver would help determine which would be best for the following. Thinking that one of the amps would work we would recommend purchasing a combination of our DSM6 and DSM4 speaker selectors. You mentioned having Impedance matching volume controls already. I would connect the DSM6 to Speaker A output and drive five pairs of speakers through a volume control for each pair. Then connect the DSM4 to speaker output B and drive the remaining four pairs again using Volume Controls. The first five pair would be set at 8X and the second four pair at 8X to be on the safe side. You can connect your second amplifer/reciever to both DSM as well. This time to the Source B input on each speaker selector. So you would connect Speaker A to Source B of the DSM6 and Speaker output B to Source B of the DSM4. Again depending on your Amplifier capabilities this would give you control over all 9 speakers while adding the capaility of having two sources to pick from for each speaker throughout the whole system.